You are here: Home › News & Publications › Campaigns › Home Page › Labour News › Locals › Local 0003 › Local 0004 › Local 0032 › Local 0083 › Local 0119 › Local 0122 › NSGEU News › It’s “Sock It To Poverty” time! 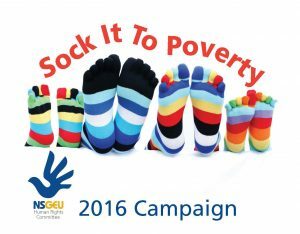 Every year, the NSGEU Human Rights Committee organizes a campaign called “Sock It To Poverty”. From now until December 15, we are asking you, if you are able, to set up a donation site at your workplace to collect new socks, mittens and hats or cash for people in need in your community. Deadline for donations is December 15. If there are donations via cheque, please ask that the cheque be made payable to: NSGEU and in the memo section-please put “Sock it to Poverty”. If you have any questions please contact Melissa Marsman at melissa.marsman@iwk.nshealth.ca (Human Rights Committee Chair). Meet your new Board of Directors!